Brok Griffith Wins the $500 Bounty Event! The final three players in the $500 Bounty event have come to an agreement on an equity chop. 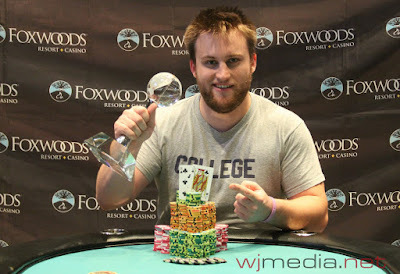 Brok Griffith is officially the winner of the event and takes home $18,600 plus the World Poker Final Trophy! Adam Agaev is all-in before the flop with [Qs][Js] and is called by Brok-Alan Griffith with [Ad][Jc]. The board runs out [Jd][Td][9d][6h][Ac] and Griffith wins the pot to eliminate Agaev in 4th place for $6,895. Kevin Eyring raises to 52,000 before the flop and is called by Brok-Alan Griffith in the big blind. The flop comes [Th][7c][6d] and Griffith checks. Eyring bets 80,000 and Griffith calls. The turn is the [5s] and Griffith checks again. Eyring fires 165,000 and Griffith again calls. The river comes the [4d] and Griffith announces all-in. Eyring thinks for a minute before announcing call. Griffith turns up [Jc][8c] for the straight and Eyring mucks his hand. Eyring is eliminated in 5th place for $5,289. Vincent O'Neill moves all-in before the flop with [Jc][Jd] and is called by Carlo Sciannamoe in the big blind with [Kd][Ks]. The board comes [5s][4s][2s][Ah][4d] and Sciannamoe's kings hold to win the pot and eliminate O'Neill in 6th place. Kevin Foley moves all-in before the flop and is called by both James Refino and Brok-Alan Griffith. The flop comes [Kd][5h][5s] and Refino checks. Griffith moves all-in and Refino mucks his hand. The turn is the [4s] and the river comes the [Qc]. Griffith's kings hold up to win the pot and eliminate Foley in 8th place. The board runs out [As][Qs][Ts][9d][5c] and Eyiring's ace with a king kicker takes the pot. Refino is eliminated in 7th place. The board runs out [Ac][Qh][6h][4h][7h] and Sciannamoe improves to a flush. Sammet is eliminated from the $500 Bounty event in 9th place for $2,463. On a board reading [Ac][Qs][4h][6d], Matthew Levine is all-in against Brok-Alan Griffith. Levine has a pair of aces but Griffith is ahead with two pair. 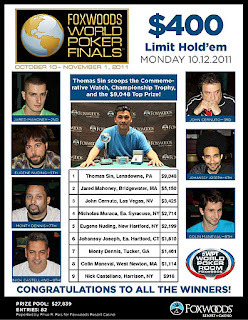 The river comes the [5h] and Griffith wins the pot to eliminate Levine in 10th place. We have reached the final table of the $500 Deep Stack Bounty event. 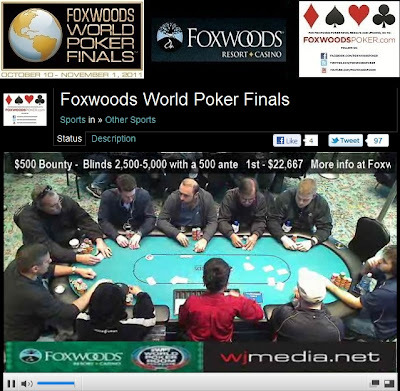 We had a total of 499 players in the $600 NLHE Deep Stack event at the Foxwoods World Poker Finals. $500 Bounty Final Day Now Streaming Live! The final day of the $500 NLHE Bounty event is now streaming live. Play is still currently in the first level and there are already over 400 runners in the field for today's $600 No-Limit Hold 'em Deep Stack event. 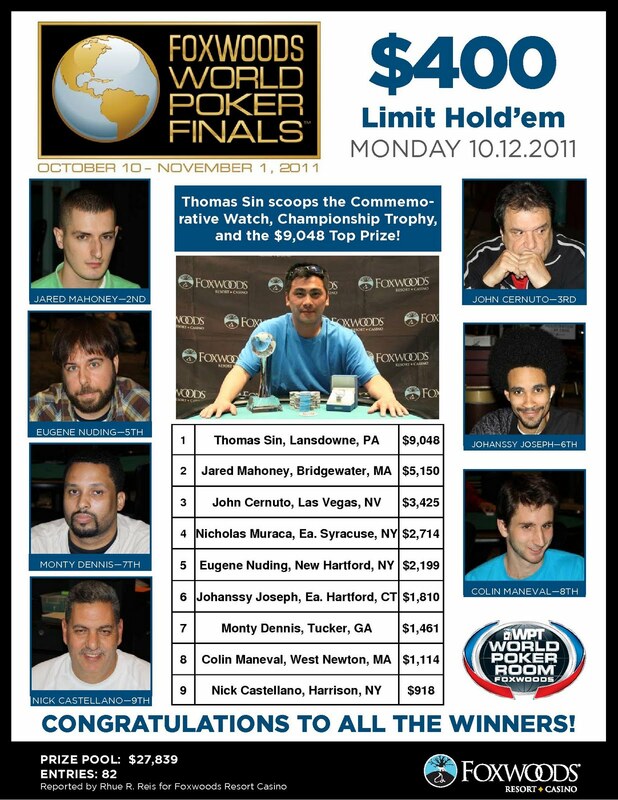 Players started with 20,000 in chips and the levels are 50 minutes in length.